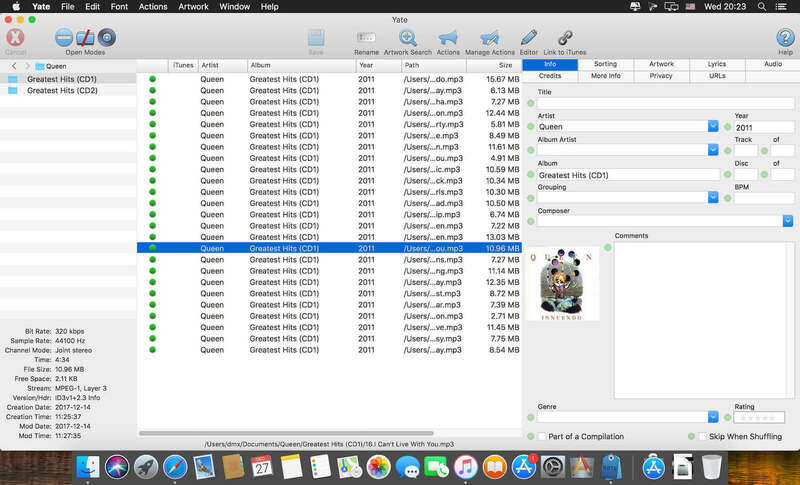 Yate was developed for people who are serious about tagging and organizing their audio files. The application was designed from the ground up for Mac users. It is a 100% Cocoa-written application and uses its own tagging library. Yate will tag mp3, m4a, aiff, flac, wav and dsf files. Yate has a long list of features; most importantly, an innovative scripting system called actions. Actions can be used to update all of an album’s tags with a single operation. Yate also supports integration with Discogs, MusicBrainz, AcoustID and iTunes. All changes can be easily reverted and individual changes can be undone in any order. Whether you want to automatically or manually tag your files, Yate can do it all! Safari has issues when being launched with a page contained in a application bundle. (such as Yate's online help). This only happens on Mojave and results in a 'Safari Can't Open the Page' message. Once Safari is open, subsequent pages load correctly. We've attempted to solve the issue by launching Safari, if not already open, and then after a delay telling it to open the page. While this seems to work most of the time, there is no guarantee that it will always work. The problem can always be solved by reissuing the help request once Safari has opened. An additional Optional qualifier is available. While Optional and Optional Once make a preceding token optional, Optional Stop makes all subsequent tokens optional. A new control is available to enable the copying and moving of list items between lists. The Action Manager has a new column named Version. The column will display the value specified on a new Version statement embedded in the associated action. Statements can now be marked as being a favourite via the context menu. The list of statements panel has a new submenu called Add Statement which displays the favourites. There is a new statement named Version. This statement can specify a version number to be displayed in the Action Manager. The File to Tag From Content statement has a new option to save the results as a key-value list as opposed to applying the changes. There is also a new option to extract the template components. The action test state is now set so you can determine the success/failure of the function. The Prompt for Text statement now supports the setting of formatting requirements to control what is input. The List Contains statement has a new option to save all matching list indexes. The Test statement has been renamed Test & Run. The statement now requires that an action be specified. Existing uses where an action is not specified are automatically changed to the appropriate Exit or Stop statement. There is a new Insert Path context menu item in the source field of appropriate Set commands. The item prompts you to select a path to a file or folder to be inserted. At times this may be easier to use than dragging a path from the Finder. The Auto Search for Artwork statement is now valid when grouped. Note that this is far less efficient than when run stepwise. The Prompt statement can now be optionally suppressed when run through the Batch Processor. The Indexed Artwork statement can now be used to determine if an artwork item is a progressive JPEG. Note that the Manipulate Artwork statement can be used to convert a progressive JPEG to a baseline JPEG. The Replace statement no longer has a Set state option. State is always set. The Find & Remove statement no longer has a Set state option. State is always set. The Open URL statement no longer has a Set State option. State is always set. The Report/Set State options have been replaced with a new option called Silent. The Regular Expression statement no longer has a Set state option. State is always set. The Truncate statement no longer has a Set state option. State is always set. The User Defined Manipulation statement no longer has a Set state option. State is always set. The Transfer Metadata statement no longer supports the saving of properties to a named variable. Yate has long used its own sort routine when issuing a sort where integers are relevant. This is typically called 'sort as in Finder'. This routine handled leading and trailing integers and avoided a few pitfalls in the standard Apple API. The routine has been completely rewritten to make it more classical friendly. It will now handle integers anywhere in the strings which makes it much better when sorting strings with multiple embedded integers. The File to Tag context submenu for Variables was labelled Variable 15. The File to Tag from Content statement was not being processed when executing an Export. This means that the template was not placed into the plist file. The Move statement was not clearing the Retained Path properties on entry. This means if you did more than one move on the same files and the second failed, the older values were not cleared. The Auto Size menu was being displayed in Preferences-Shortcuts on older OS versions where it should not have been displayed. The Test & Run statement with a combination of the Grouped, Once and Exit settings was not working. The Exit semantics were not applied. The Regular Expression statement's return Matches+ options was not working. It was working in the Regular Expression Tester. Multiple item highlighting was not working correctly in the Regular Expression tester for some modes. When saving property lists with the Transfer Metadata statement to a variable > 9, the data was not saved. Parameters in variables > 9 on the Run External statement were not passed correctly. Searching for a track variable in an Action Editor Window went into an infinite loop if the action contained a A0 or A1 escape sequence. Certain combinations of the Extract Replacement Set statement were not retaining the correct save-as value. v4.6 regression: The FLAC/OGG and APE preference mapping controller's F buttons were not working. The APE preference mapping controller's 1 button was not working. Files with APE tags were not properly merging multiple low level items mapped to the same field.